Abu Dhabi is the capital of the United Arab Emirates. As modern and wealthy as any of the neighboring Emirates it does offer the visitor fascinating glimpses of the Gulf culture as it exists today. This tour gives a good overview of the city but also gets you out into the desert and to Al Ain at the Omani border. 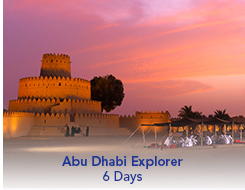 Arrive to Abu Dhabi, United Arab Emirates, where you are met and escorted your hotel. The remainder of the day is at leisure.